Preheat the oven to 500° F. Yes, 500. Empty the mixture into a large bowl. Add buttermilk and stir until combined but raggedy. Dump onto a well-floured counter. Knead a couple of times, pat into a rectangle, roll out a bit, and fold into thirds like a letter. Roll out again and fold into thirds like a letter. Roll out again to a thickness of about a half inch and cut with a 2-3 inch biscuit cutter. 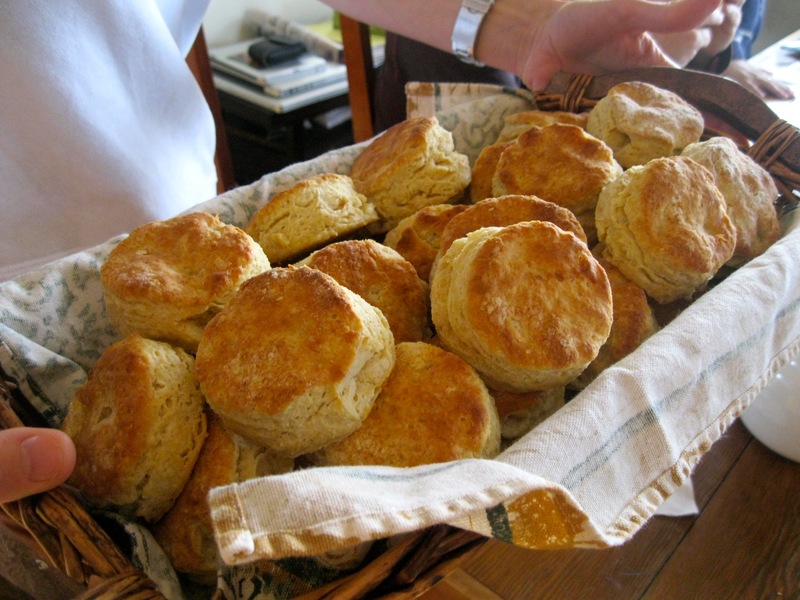 Eat warm, while reading my essay on The Perfect Biscuit. These are my favorite biscuits, ever. The end. I thought I had commented. These make winter bearable! Kate–love your piece on statues and pedestals (I’m a friend of your sister Any’s)–but on to cooking. This recipe looks great, but I don’t have a food processor big enough. Would good old fashioned elbow grease and a pastry cutter work for mixing in things? Yes, I’m sure it would. Make your life easier by cutting the butter into thin slices with a knife before cutting it in . . . and let me know how they turn out.